Most watch companies can be classified according to their typical output. Over time, some have specialized in high-end complicated pieces and dress watches (such as Vacheron Constantin and Patek Philippe), whilst others have pursued the market for professional wristwatches (for example, Rolex or Omega). For many, this specialization took place shortly after the Second World War, when the demand for more robust and functional timepieces began to soar, pushing some of the more traditional Maisons out of their comfort zone. The reference 6782 Turnograph from Vacheron Constantin is one of those experimental watches. With a rich heritage characterized by elegant dress watches, Vacheron Constantin’s production of sport/tool pieces was virtually non-existent until the release of the "Turnograph" nicknamed as such due to its similarities to the Rolex reference 1625. Rather thick for dress watches of the time, the reference 6782 features a waterproof case and rotating bezel to measure elapsed time. However, the reference 6782 remains an overtly luxurious timepiece. The attention to detail in the milling of the bezel and more importantly, the use of gold instead of stainless steel for the case and bezel make this "Turnograph" incomparable to other sports watches from the same era. In many ways this watch was way ahead of its time, and ultimately Vacheron Constantin chose to retire their luxury sports watch within a few years of its initial release. The present example, fresh to the market, is offered in exquisite condition. It retains all of its original factory finishes. 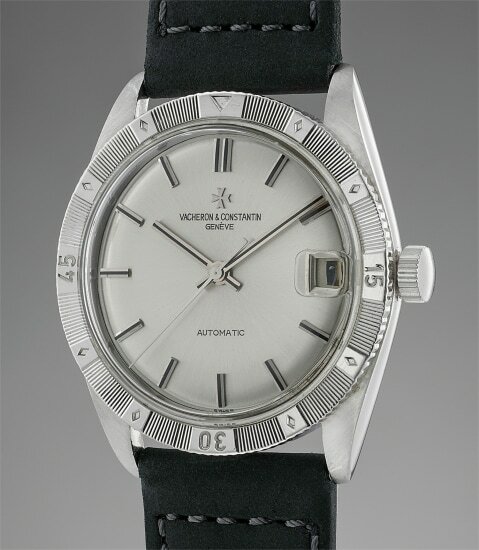 The circular screw down case is unpolished, the lugs display original finishes and clear defined lines, while the silver “Star Burst” dial is clean and in all original condition. Made predominantly in yellow gold, the present reference 6782 is only the third white gold version known, interestingly each of the white gold models having a slightly different bezel. The waterproof case, rotating bezel and overall sporty look could possibly make the Vacheron Constantin "Turnograph" the first sports chic model to be made by a traditional watch brand a few years before the launch of the Royal Oak! The present Vacheron Constantin “Turnograph” is one of the company’s most exclusive and elusive models and a treasure for the most discerning collector especially in this ultra rare white gold livery.